She raised her hand for silence. 彼女は手を上げて静粛を求めた. raise a sunken ship 沈没船を引き揚げる. Our salaries were raised a little bit. 我々の給料はほんの少し上げられた. The stress raised my blood pressure. そのストレスで私の血圧は上昇した. He was raised to manager. 彼は支配人に昇進させられた. It was this song that raised the group from obscurity to fame. そのグループを無名の状態から有名な地位へ出世させたのはまさにこの歌であった. She raised her voice angrily. 彼女は怒って声を荒らげた. That joke will raise a laugh. そのジョークは笑いを起こすだろう. These facts raised doubts in their minds. これらの事実を知って彼らの心に疑惑が生じた. raise a person's hopes 人の希望を奮い立たせる. raise a cloud of dust もうもうとした土ぼこりを立てる. raise a fallen chair 倒れたいすを起こす. raise a man from his knees ひざまずいている人を立たせる. He raised himself (up) to his sitting position [his full height]. 彼は体を起こして座った姿勢になった[立ち上がった]. raise a protest [an objection] 抗議[異議]を提出する. No one raised any questions. だれも何の質問もしなかった. raise an oil embargo 石油輸出禁止を解く. Reinforcements came and raised the siege on the fort. 援軍が来て要塞(ようさい)の包囲を打ち破った. 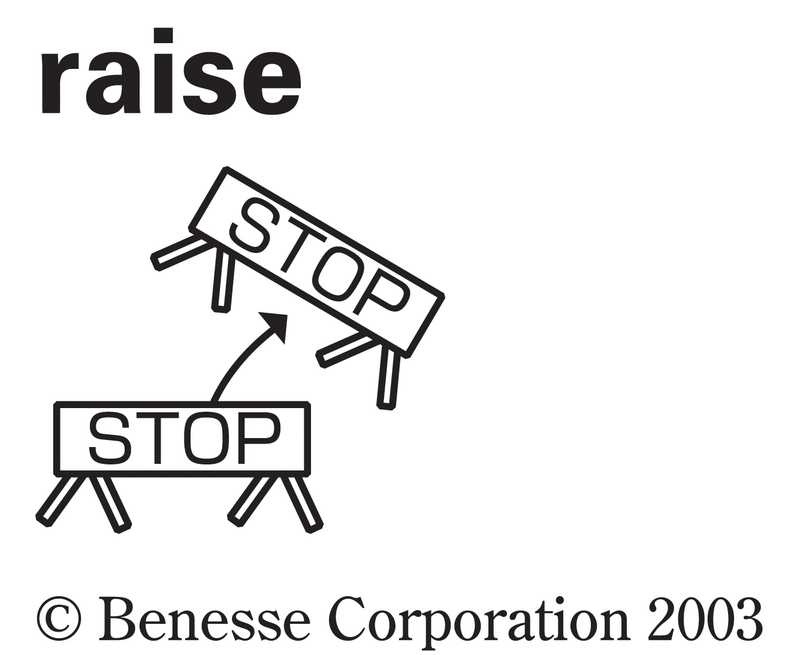 raise a person from the dead 人を生き返らせる. raise a large family たくさんの子供を育てる. He was born and raised in a country town. 彼はいなか町に生まれ育った. The farmer raises crops and cattle. 農夫は農作物を栽培し牛を飼っている. They're raising funds for the expedition. 彼らは探検の資金を調達しているところだ. raise an army 軍隊を集める, 兵を起こす. 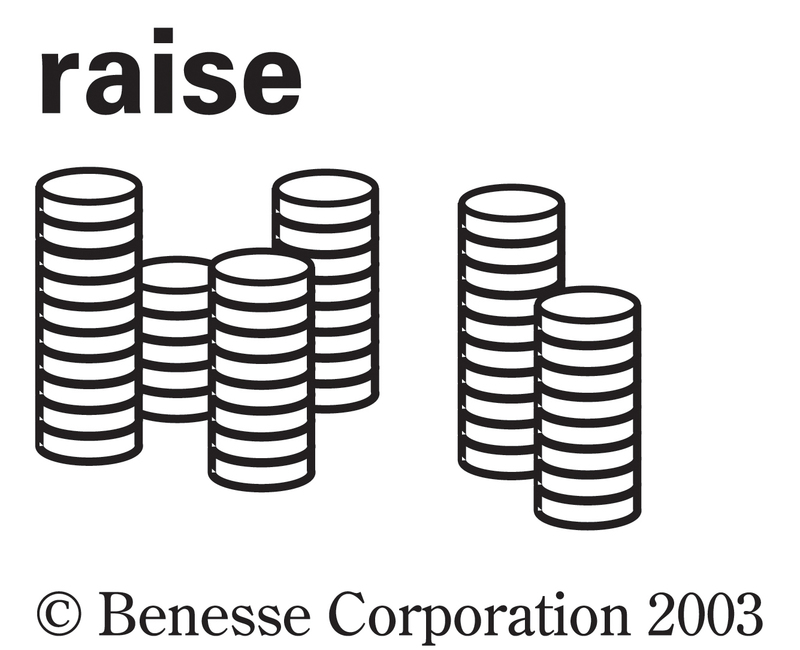 ask one's boss for a raise 上司に昇給を申し出る. Let's all raise our glasses and drink a toast to our success. Please raise your hand if you have any questions. He raised his eyebrows and looked at her in amazement. Jim raised a little boy in his arms. The government raised a monument to the veterans of the civil war. They tried to raise standards in primary schools. He was raised to a higher position. Don't raise your voice here. A gust of wind raised the fallen leaves. Living in Asia has raised her cultural awareness. I was raised by my aunt. The news raised their fears. Her behavior raised a laugh. The charity concert raised more than two million yen for children of traffic victims. An army was raised in an emergency. She raised the subject of money again. We'll give you a raise. Jim poured water on his daughter's face to raise her. The price of housing has risen 17% in the last year. When the robbers occupied the bank,Clyde was the first to raise the alarm. My hopes were raised when Sally gave me an inviting glance. Do you know what 10 raised to the power of 5[10 raised to 5th power] is? The wife's fears were raised even further when her husband didn't return home. He was able to raise a smile at his visitors from his hospital bed. During the meeting, Fred raised a question concerning the budget to carry out the project. The ship raised land after a-year voyage at long last. John really raised hell at Jimmy's party. After being knocked down by a bicycle, Jan slowly raised himself off the pavement. We raised the roof when our Olympic champions returned home. From Middle English reysen, raisen, reisen, from Old Norse reisa (“to raise”), from Proto-Germanic *raisijaną, *raizijaną (“to raise”), causative form of Proto-Germanic *rīsaną (“to rise”), from Proto-Indo-European *h₁rey- (“to rise, arise”). Cognate with 古期英語 rāsian (“to explore, examine, research”), 古期英語 rīsan (“to seize, carry off”), 古期英語 rǣran (“to cause to rise, raise, rear, build, create”). Doublet of rear. (physical) To cause to rise; to lift or elevate. To form by the accumulation of materials or constituent parts; to build up; to erect. To cause something to come to the surface of the sea. The ship was raised ten years after it had sunk. (nautical) To cause (the land または any other object) to seem higher by drawing nearer to it. To make (bread, etc.) light, as by yeast or leaven. (figuratively) To cause (a dead person) to live again, to cause to be undead. The magic spell raised the dead from their graves! (military) To remove or break up (a blockade), either by withdrawing the ships or forces employed in enforcing it, or by driving them away or dispersing them. (transitive) To create, increase or develop. We need to raise the motivation level in the company. To bring up; to grow; to promote. We visited a farm where they raise chickens. Chew with your mouth shut — were you raised in a barn? To mention (a question, issue) for discussion. A few important questions were raised after the attack. (law) To create; to constitute (a use, または a beneficial interest in property). There should be some consideration (i.e., payment または exchange) to raise a use. To bring into being; to produce; to cause to arise, come forth, or appear. God vouchsafes to raise another world From him [Noah], and all his anger to forget. To establish contact with (e.g., by telephone または radio). Despite all the call congestion, she was eventually able to raise the police. (poker, intransitive) To respond to a bet by increasing the amount required to continue in the hand. John bet, and Julie raised, requiring John to put in more money. (arithmetic) To exponentiate, to involute. Two raised to the fifth power equals 32. (linguistics, transitive, of a verb) To extract (a subject または other verb argument) out of an inner clause. (linguistics, transitive, of a vowel) To produce a vowel with the tongue positioned closer to the roof of the mouth. To increase the nominal value of (a cheque, money order, etc.) by fraudulently changing the writing or printing in which the sum payable is specified. 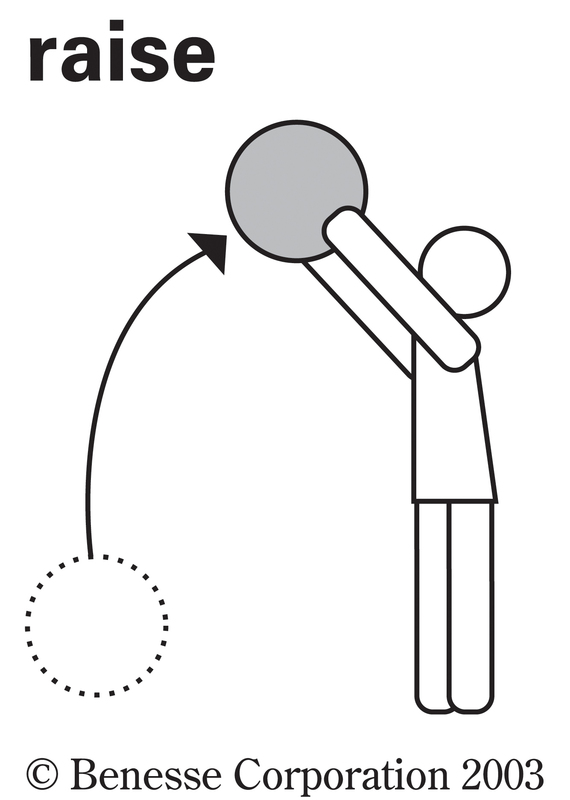 (computing) To throw (an exception). A division by zero will raise an exception. It is standard US English to raise children, and this usage has become common in all kinds of English since the 1700s. Until fairly recently, however, US teachers taught the traditional rule that one should raise crops and animals, but rear children, despite the fact that this contradicted general usage. It is therefore not surprising that some people still prefer to rear children and that this is considered correct but formal in US English. It is widespread in UK English and not considered formal. It is generally considered incorrect to rear crops or (adult) animals in US English, but this expression is common in UK English. (US) An increase in wages or salary; a rise (英国用法). The boss gave me a raise. (weightlifting) A shoulder exercise in which the arms are elevated against resistance. (curling) A shot in which the delivered stone bumps another stone forward. (poker) A bet which increased the previous bet. From Old Norse hreysi; the spelling came about under the influence of the folk etymology that derived it from the verb. A cairn or pile of stones. RAISE (Rigorous Approach to Industrial Software Engineering) was developed as part of the European ESPRIT II LaCoS project in the 1990s, led by Dines Bjørner. It consists of a set of tools based around a specification language (RSL) for software development. It is especially espoused by UNU-IIST in Macau, who run training courses on site and around the world, especially in developing countries.